The luxury headphones are Logic3’s product and the sporty design was inspired by Ferrari’s racing team, incorporating design cues from the pits headphones used by the Ferrari F1 team. ey guys, this video review is inspired by Ferrari. Unfortunately, we could not bring a whole car into the studio so I will go with something that let’s say will bring the most realistic engine sound to you. 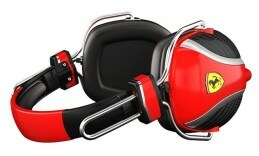 Ok, I am not going to beat around the bush any more, this are the Ferrari inspired P200 headphones. The luxury headphones are Logic3’s product and the sporty design was inspired by Ferrari’s racing team, incorporating design cues from the pits headphones used by the Ferrari F1 team.The headphones come in an elegant black hard case trimmed in carbon with a textured surface on the top of which the Ferrari logo is placed. Unsurprisingly the headphone’s design is sporty. Being inspired by the Italian brand, of course, how can we go without the classy red color that is stylishly combined with black. The over-ear type of these headphones in combination with the ultra-soft ear pads provide the ultimate isolation from background noise so that all you listen to is the music you like. The headphones have a solid construction which features robust machined crafted metal arms and carbon fiber textures to ensure durability and quality. The speaker sensitivity is 110dB at 1Khz and the frequency response from 20-20 000Hz. No more cable tangling, the detachable in-line remote anti-tangle cables come in trimmed in woven fabric so that you just plug them without having to know how to untie a seaman’s knot. For even greater control comfort there is a 3-button remote control function on the cable. The Ferrari P200 headphones by Logic3 are compatible with all of the most common platforms.